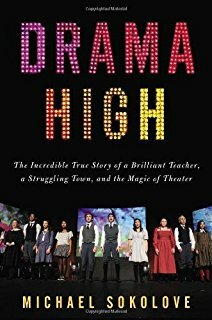 "Friday Night Lights meets Glee—the incredible and true story of an extraordinary drama teacher who has changed the lives of thousands of students and inspired a town. Why would the multimillionaire producer of Cats, The Phantom of the Opera, and Miss Saigon take his limo from Manhattan to the struggling former steel town of Levittown, Pennsylvania, to see a high school production of Les Misérables? To see the show performed by the astoundingly successful theater company at Harry S Truman High School, run by its legendary director, Lou Volpe. Broadway turns to Truman High when trying out controversial shows such as Rent and Spring Awakening before they move on to high school theater programs across the nation. Volpe’s students from this blue-collar town go on to become Emmy-winning producers, entertainment executives, newscasters, and community-theater founders. Michael Sokolove, a Levittown native and former student of Volpe’s, chronicles the drama director’s last school years and follows a group of student actors as they work through riveting dramas both on and off the stage. This is a story of an economically depressed but proud town finding hope in a gifted teacher and the magic of theater." All meetings will take place in the loft space at the Wolverine Farm Bookstore inside Bean Cycle Roasters. Copies of the book are paid for by the theater department and will be yours to keep. Notifications about schedule changes, etc., will be sent via our Remind 101.